Food Fact: Tapioca is a starch extracted from the root of the cassava plant. It is known by many names most commonly cassava, sagudana meaning sagu drops, with local variation of sabudana and kappa. Tapioca is gluten free, and nearly protein free. The commercial form of tapioca most familiar to many people is pearl tapioca. Pearls are made in several sizes, ranging from about 1 mm to 5 mm. In good quality pearl tapioca, the pearls are very uniform in size, smooth, and few are broken. Small pearls are preferred for use in puddings;while large pearls are preferred for use in drinks. In all its forms tapioca starch is opaque before cooking; after cooking it becomes translucent. As a drink they are prepared by boiling for 25 minutes, until they are cooked thoroughly and are chewy, though not gummy, then allowed to cool. 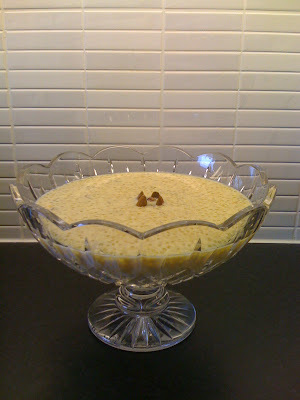 For use in tapioca pudding, pearls are prepared simply by soaking them overnight in water. Heat a pan, pour in the oil and fry the chopped almonds till brown. Fry the raisins till they appear bloated. Keep aside. Soak the sago in water for 15minutes then drain and keep aside. Bring 5 cupfuls of water to the boil. Put in the soaked sago, stirring the water while doing so to prevent lumps forming. When the sago begins to appear transparent/ clear, add the sugar. Stir constantly till the sugar dissolves. In a milk pan bring milk to a boil and steep in 2 slit vanilla pods. Once the vanilla has infused into the milk add it to the sago, stirring all the time. Add the nuts and raisins bring the mixture to one boil then turn off the heat. Serve chilled.